1. 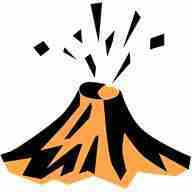 Shape some modelling clay into the shape of a volcano and use your thumbs to make a well for the inside of the volcano. 2. Put a spoonful of baking soda in the volcano well. 3. Put a few drops of red food coloring in the well. 4. Pour a bit of vinegar on top of the baking soda and red food coloring and stand back. Best to do this experiment outside as it can be a bit messy.